The US has every chance to take the world championship football in 2026. About this said the head of the international Federation of football Association (FIFA) Joseph Blatter in an interview to local media. «If you pay attention to the rotation of the world championship, he is obliged to go back to Africa or America,» said Blatter.- And since not so long ago, the tournament was held in South America, I think, in North America chances to get more of it». «The U.S. is distinguished by the huge commercial opportunities, a huge TV audience, which shows great interest in football. 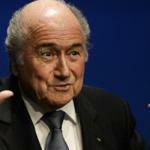 We had a wonderful world Cup in the USA in 1994, but now the possibilities are much broader,» added the head of FIFA.